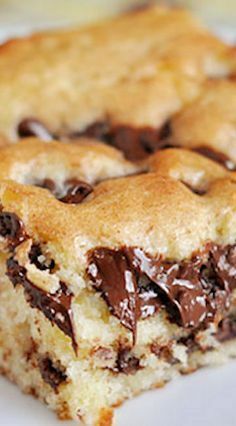 This chocolate chip cake is so moist and tender! Incredibly easy to make, the sprinkle of cinnamon and sugar with the chocolate chips puts it over the top! I don’t know that I’ve ever had a sheet cake this soft, this unique, this delicious. 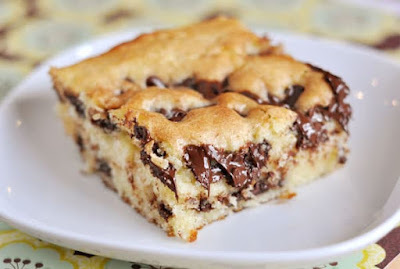 If you haven’t made this chocolate chip cake, don’t wait any longer! It is the perfect solution when you need a quick dessert fix for company or a Sunday night treat or for a potluck offering. Preheat oven to 350 degrees (325 if using a glass pan). Grease a 9 X 13 pan with cooking spray. In a large bowl combine all of the cake batter ingredients. Mix for 1 minute at low speed; mix 3 minutes at medium speed. Pour 1/2 of batter into greased pan. Generously sprinkle cinnamon and sugar over batter making sure to get the corners and then sprinkle with 1/2 bag of chocolate chips. Pour remaining cake batter on top and spread across bottom layer. Repeat with cinnamon and sugar and chocolate chips. Bake for 30-35 minutes or until a toothpick comes out with only a few crumbs (don’t overbake or cake will be dry!). 0 Response to "CHOCOLATE CHIP CAKE"